Backyard gardeners rely on Sonoma Compost to improve their soil and make it easier to work and more productive. All garden soils benefit from the increased percentage of organic matter that a generous application of compost provides. Soil organic matter is a key component to building soil structure, improving soil tilth and making garden soil easy to work. Soil porosity and aeration will improve with compost use and huge populations of beneficial microbes will be introduced to the soil. 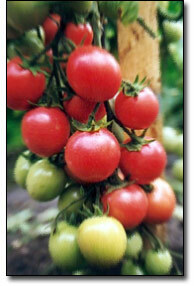 At the same time the availability of slow release nutrients will benefit both soil and garden plants. There are particular benefits that compost brings to both heavy clay soils and lighter, sandy soils. The heavy clay soils in Santa Rosa, Rohnert Park and Petaluma will benefit from improved porosity and better drainage. The sandy soils in western Sonoma County will have a greater moisture holding capacity, which will result in making nutrients in the soil, such as potassium, more available to plants. Finally, an application of good quality, compost will provide a haven for earthworms. Earthworms are one of our best indicators of soil health. They convert organic matter to nutrient-rich castings and their tunneling activities aerate and lighten the soil. If earthworms like your garden soil, your veggies will too!